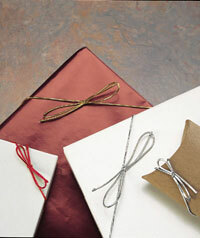 50 - 8" STRETCH LOOPS, 17" CUT for box sizes up to 5.5"x7.5". Gold metallic stretch loops, already cut and tied in a bow, ready to go on proof boxes, folios, or anything else you would like to dress-up. Bulk-discount pricing on quantities of 1000+ bows. 1/8" wide 25 yard (75 feet) spool to make your own custom-size bows. Choose color.